By now you should know, I’m not much of a hiker. I’m outdoorsie, sure – I’ll go rafting, mountain biking, play ball and all – but I don’t hike. Now I know what you’re thinking, but it’s Machu Picchu. And I thought about this long and hard, but in the end I decided not to. 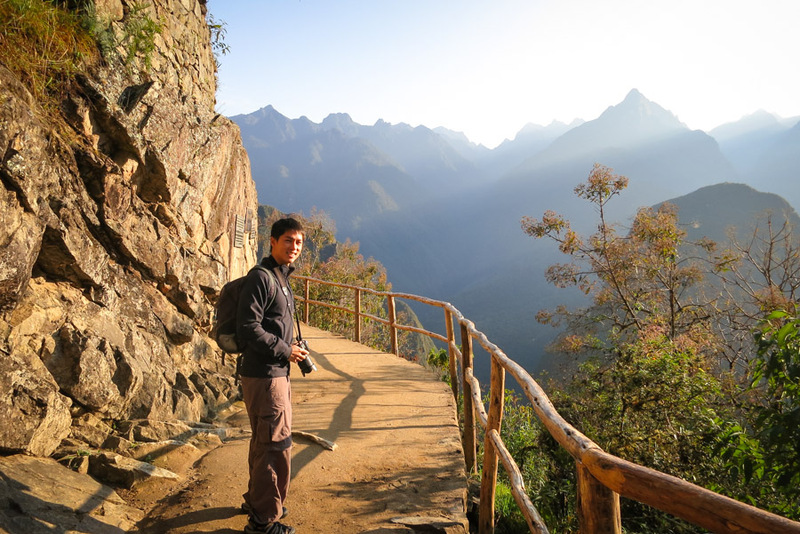 Plus, I didn’t want to do it simply because people told me it’s the Inca Trail. I want to do it because I would enjoy it, and I’m sorry but the thought of 4-days of hiking with mosquitos, sketchy toilets and no showers not to mention possible rain sounds awful and torturous. 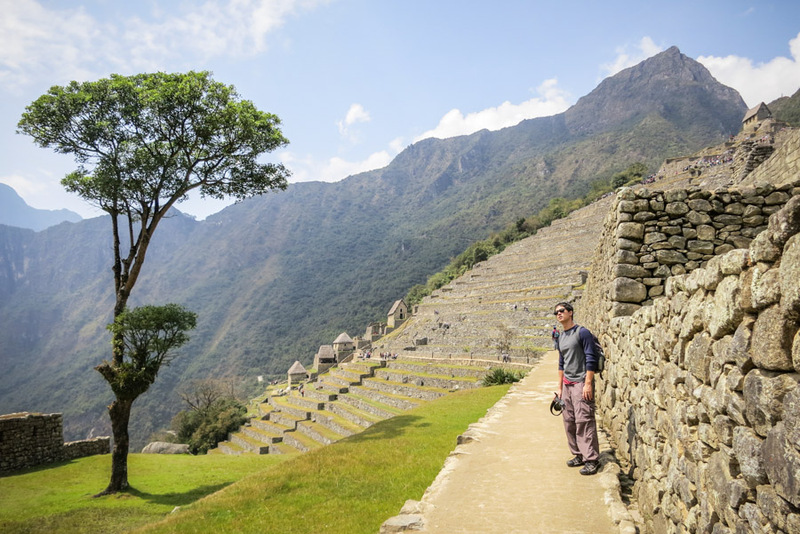 Not even the thought of hiking up-hill for 2-hours from Aguas Calientes to Machu Picchu appealed to me so imagine how happy I was to find they had shuttle buses! 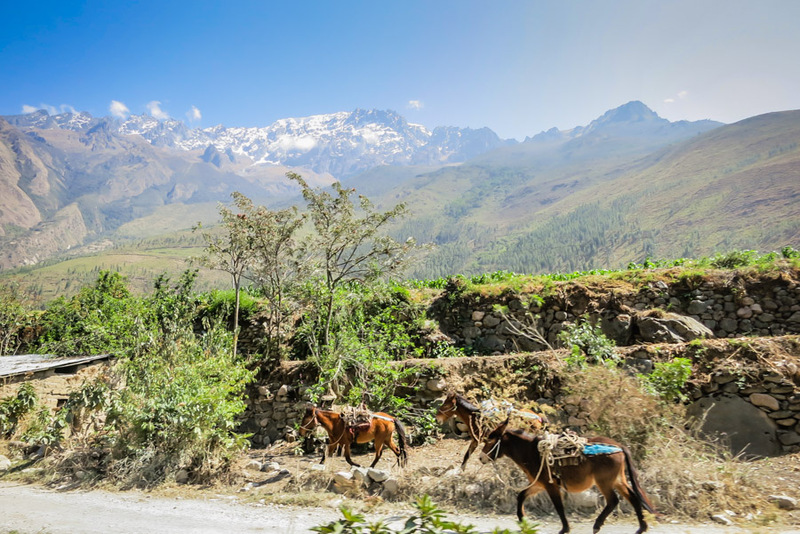 Bahahaha..
We took the train from Cusco to Aguas Calientes and I was pleased – the ride boasted some stunning views of the snow-top mountains and countryside. We even saw hikers on the trails along the way. 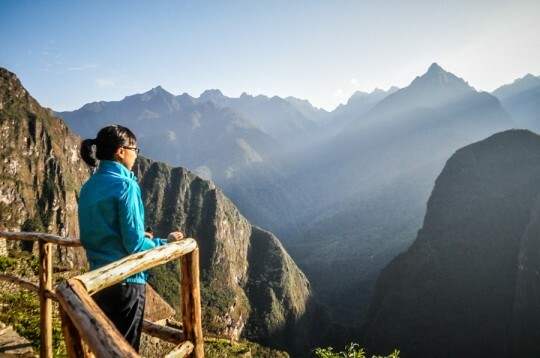 We decided to stay in Aguas Calientes the first night of arrival and see Machu Picchu bright and early the next morning. I was nervous we wouldn’t be able to see anything, like our Golden Gate Bridge, Machu Picchu is notorious for being shy – it’s always clouded in. But as you can see below, the weather was absolutely perfect. 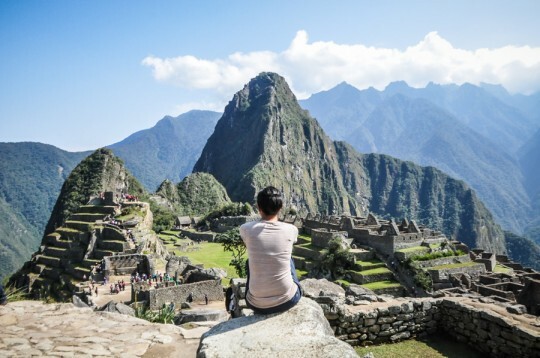 As some of you can remember from our 3-minute video, I gasped at the first sight of this..
We spent time being tourists, doing what tourists do when in Machu Picchu. 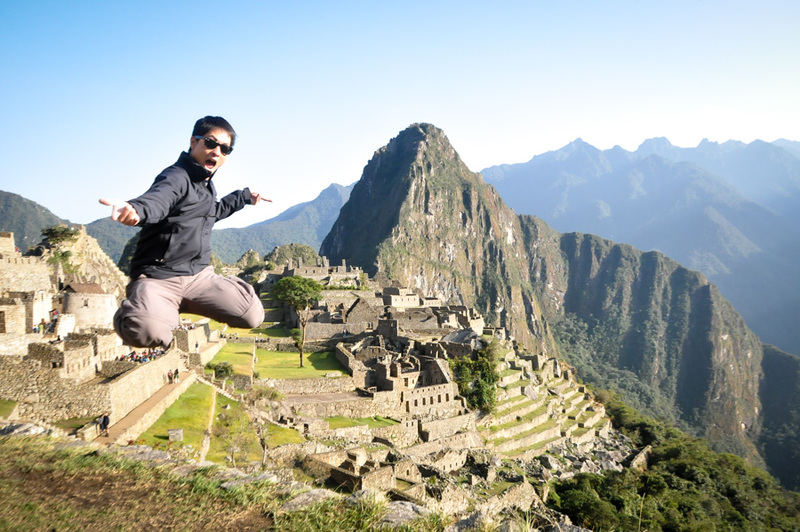 We took silly ‘travel to Peru’ pictures like this one..
We jumped. Correction.. Gerard jumped. We even brought Gangnam style to Peru! LOL.. Kudos if you can tell me — Llamas or alpaca? Gerard was stopped several times by Peruvian tweens asking to take photos with him. Just him. In fact, they asked me to take the photos. Maybe it’s the Asian Justin Bieber in him..
By 11am, it started getting busy. 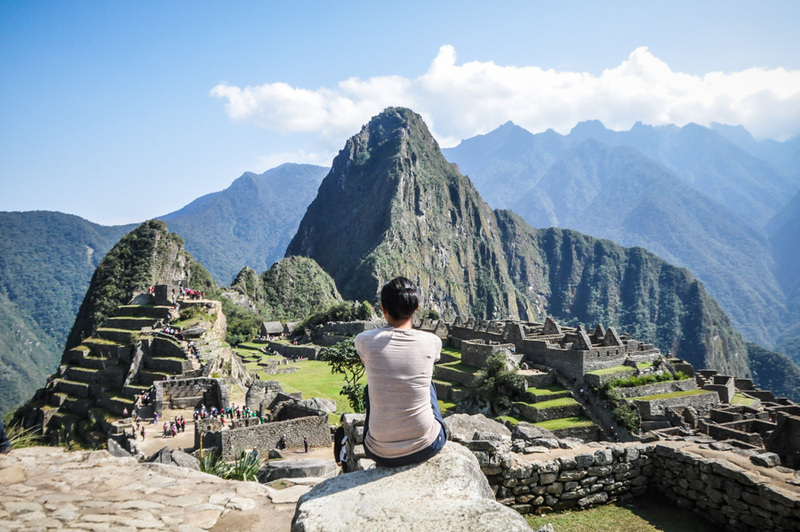 Most people come straight from the train from Cusco because they’re on a day trip journey which sounds exhausting but not entirely impossible. Once the crowd comes, you really do need a lot of patience and timing if you want to have that special picture where it looks like you have the ruins all to yourself. Here’s Gerard with a lot of patience. He waited to snap this picture of me alone with the ruins. And this is me returning the favor — Gerard sitting on the same rock. Clearly I have no patience at all. Or the concept of good camera angle for that matter..
We finished by noon and made it back in time for lunch before we boarded the 4pm train back to Cusco. 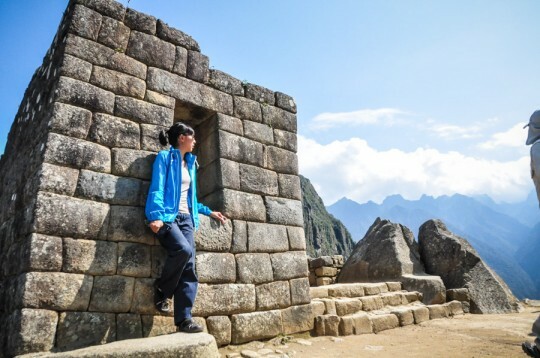 So maybe this wasn’t the Macchu Picchu experience most partake in, after all, everyone I know who’s done it has hiked the trails. But hey, we did it our way and I have no regrets. Besides, one look at the sweaty hikers at the top and I was sure I made the right decision. But I’ll be honest, to see the look of sheer joy for accomplishing such a hike brought a smile to my face too. I was proud of them for completely the hike. Hell, I was just glad I was willing to make it up the steps. Haha..
Planning your own train ride to Machu Picchu? We booked our train tickets one month in advance on Perurail.com. There is a Perurail kiosk in the Lima airport where you can pick up your train tickets – just show them your online confirmation. We booked our Machu Picchu entrance tickets in Cusco just two days before visiting the site. 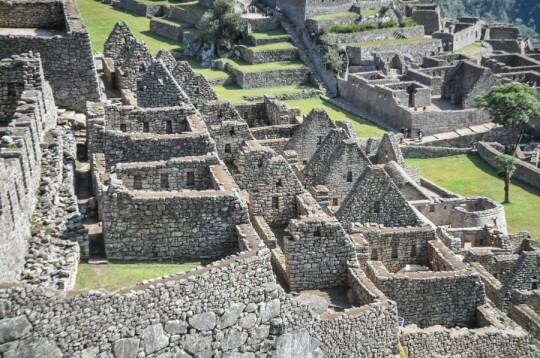 From Cusco, it’s a short taxi ride to Poroy where the train will depart for Aguas Calientes. We stayed overnight in Aguas Calientes and caught the early morning bus up to MP. Once done, we took the late-afternoon train back to Poroy, bargained for a shared taxi back to Cusco. 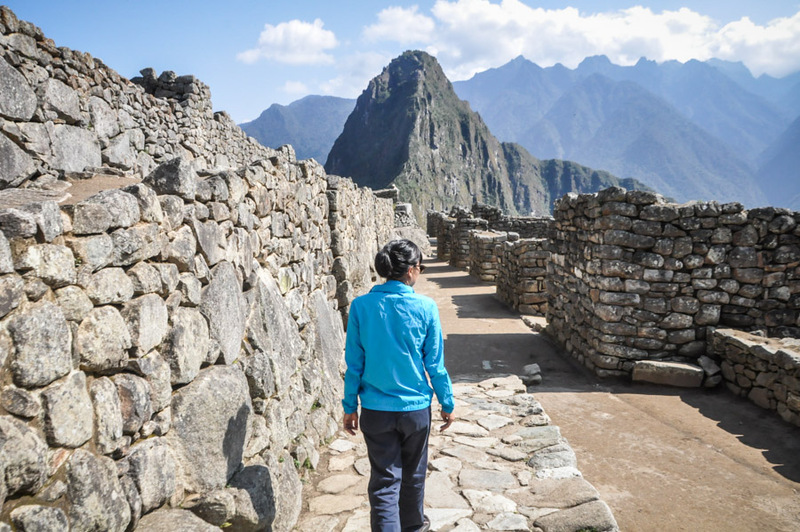 Is hiking the Inca Trail to Machu Picchu on your bucket list? Great morning light on the photos with the wooden railings! It was overcast when we were there so our early morning photos are depressingly grey. We also stayed in Aguas Calientes and it was the best thing we could have done. 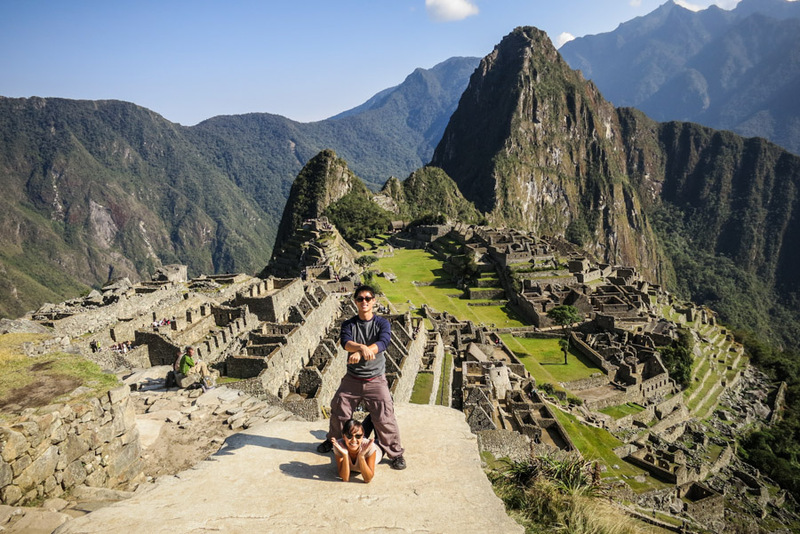 We did the short hike up to Machu Picchu Mountain, which was enough for me, as we had done a 5-day trek in Chilean Patagonia right before. So I don’t regret not doing the Inca Trail! o0o… Now Patagonia is something we’d probably be more inclined to hike through. 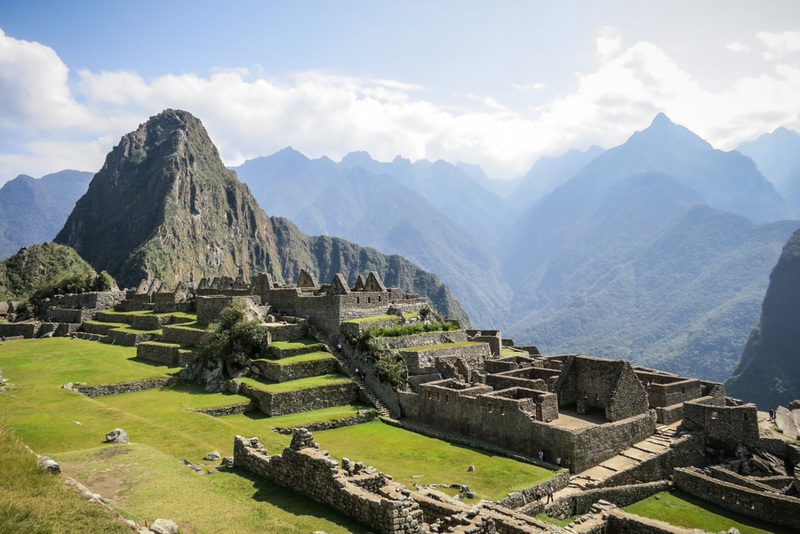 I have to say, the hike was really rewarding, but at least for me, by the time I reached Machu Picchu, I just didn’t even care anymore. Our guide led us around and then we had hours of free time, but most of us pretty much left less then 30 minutes later. After arriving in MP at sunrise, we were down in AC by 11am. Kind of waste in terms of seeing MP, but oh well! Still a once in a lifetime adventure! 10K miles? That’a s steal! Way better thank our 80K miles we used. But we were coming from SFO. Sleeping in a hostel definitely more comfortable than 4 day hike. Especially when it gets cold. eeek! Never feel bad about any decision, the decision you made at the time was the best one for you & I’m sure you’ll stand by it for a long time to come, just like you do now. Whilst the idea of the hike does interest me, I’m certainly glad (and I know Franca will be too) that there’s at least the option if we choice it, which I didn’t know before now. So thanks! I’d be happy to do that. So, hike half way & take the train for the last half? Can I reiterate this Day 2 disaster theory?! I did the Salcantay trail, not Inca, but a rogue horse ran through our group on the second day and broke my friend’s collarbone. We had to construct a stretcher out of walking poles and anoraks and carry her for 4 hours to get to a campsite and somewhere with phone signal… Utterly unreal. I loved the trek but my god it was dramatic! OMG!.. I’m so sorry I think I laughed a little at the dramatic part but gosh that sounds awful. Hope your friend heeled up 100 and your trek wasn’t a total lost. 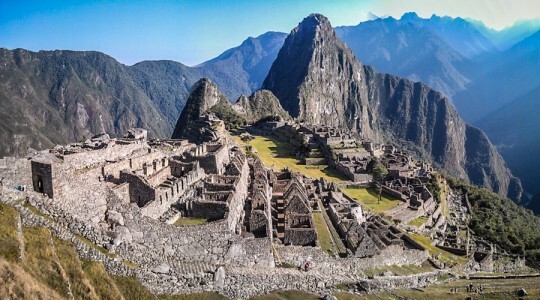 We’re heading to Machu Picchu in a couple of months and I’m very much looking forward to seeing it. Though I love a good walk, I can’t shake this niggling feeling that the hike is just not going to be my cup of tea. Well from reading this I’m so thrilled that there is an alternative for those of us who don’t thrive in muddy, cold, rainy and physically demanding conditions. I’m off now to do some research on doing half hike, half train! People who haven’t hiked it give us a hard time but once they’ve done it, they totally understand why we would want to take the train. haha.. I remember running into some Germans on the train – they were doing a one day hike. Hopefully you’ll get info on that. Good luck! Driving in South American is so scary.. but love that you found a different route. Thanks for the rec! Fell in love with your pictures of peru and bolivia! We were hoping to do a similar trip for 2 weeks but turns out we needed to stay in the US the first half and now we only have a week to travel abroad. Do you think 7 days for peru and bolivia is too crazy to even consider? we’re mainly interested in macchu picchu and the salt flats. any advice? Thanks in advance! 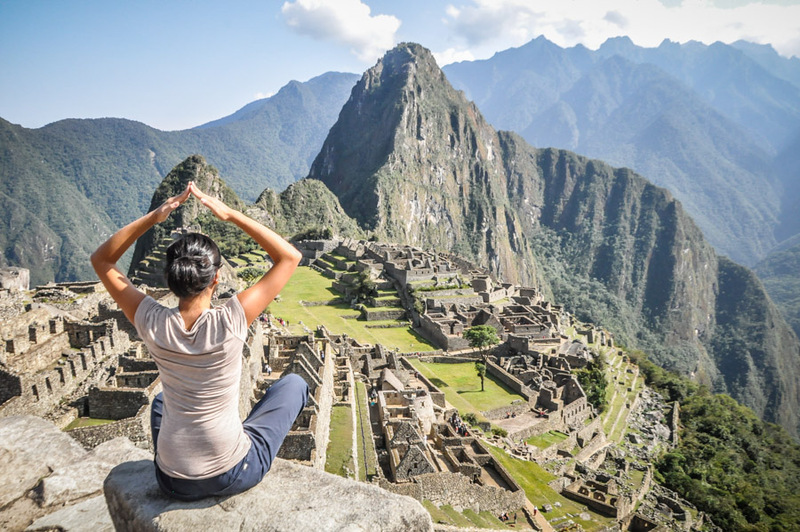 7 days in Peru & Bolivia to see the Salt Flats and Machu Picchu would be possible if you could teleport. If you can’t, I’d recommend sticking to one country. Flying in South America can be really expensive. I would stick with a week in Peru. That’s enough time for Lima, Cusco and MP. 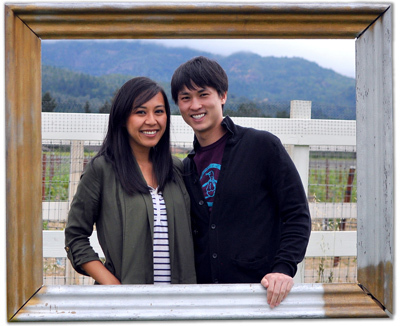 Gerard and Kieu – Great post! 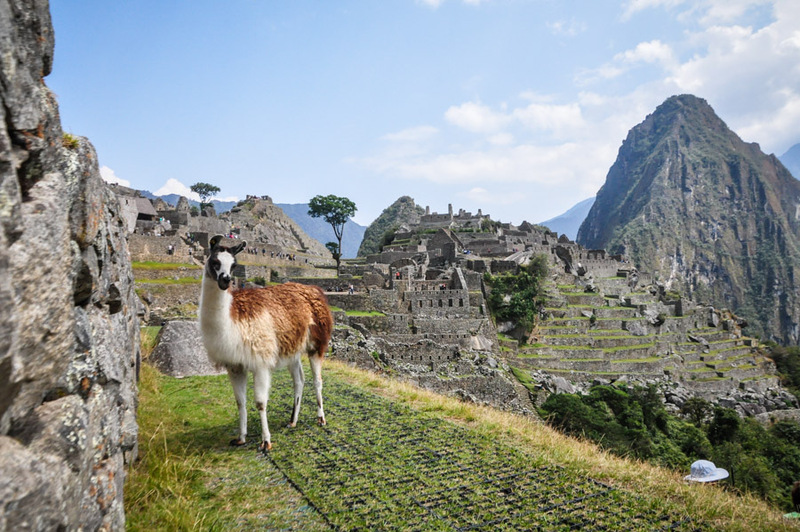 My partner and I are going to do a similar trip next month, and you seem to be pretty similar to us so I’d like your advice… We are planning on taking a taxi tour from Cusco through the Sacred Valley, then the train from Ollan to Águas Calientes. Stay the night in AC and then get up early for MP, and then take the afternoon train back to Cusco. We would like to fit in some time at the hot pools in AC. I’m unsure how we should plan our timing. What time should we leave Cusco with the Taxi? What time should we take the train to AC? How many hours do most people spend in MP usually? We are thinking about going up to the higher level of MP. And what time should we take the Train back to Cusco after a day in MP? Not sure how long the taxi tour is, so can’t say when to leave Cusco. I would really base my timing around the perurail schedule. You can easily take the train back around 4 or 5pm. 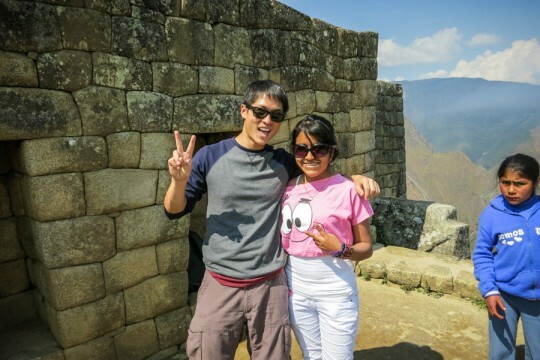 We were only at Machu Picchu for about 2.5-3 hours. We went through it a lot faster than expected. But then again, we didn’t have a guide, so that was another reason we got to go at our own fast pace. 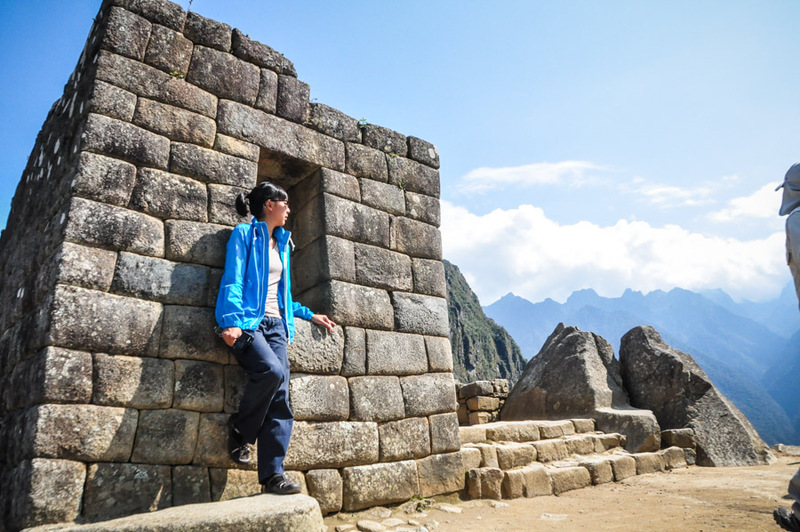 You’re probably thinking of going to Wanya Picchu, if that’s the case, I would definitely recommend spending another few hours. I believe they limit the number of people who can hike up there, so sign up early! 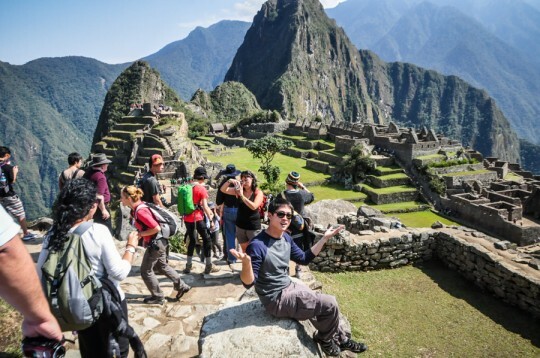 It looks like there weren’t that many visitors during your visit to Machu Picchu. Most of the time the city is full of crowds. You were also lucky with the weather!